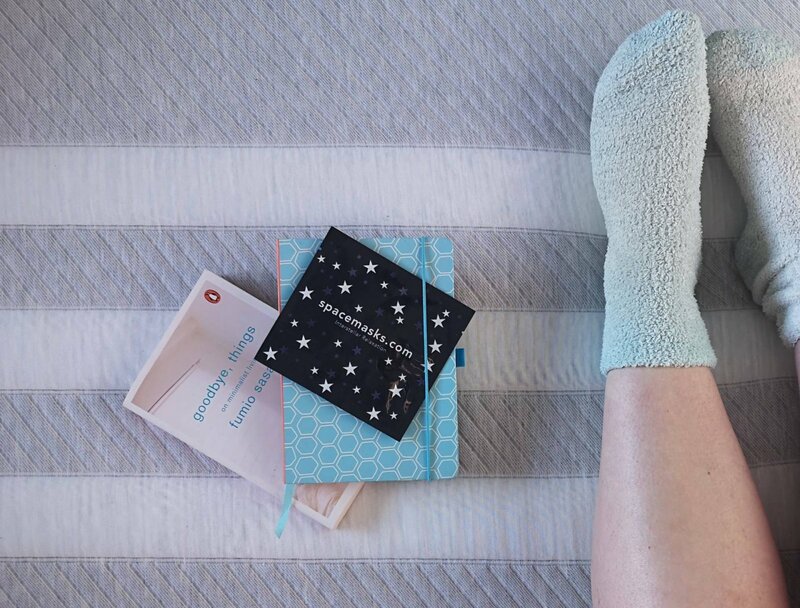 Around six weeks ago I had an email from the team at Leesa, asking if we’d like to partner with them to review a mattress and create some content illustrating our experiences. If you’re a long time reader of my blog you’ll know sleep is something of a sore subject for our family. Until she was around three Luisa was very reluctant to settle in her own room at night, whilst that has changed now keeping here there remains a work in progress! With that said over the last five months we have all been enjoying a lot more rest, which is wonderful. Matt and I decided to celebrate by redecorating our room, we wanted to make a very simple, calm sleeping environment. First we painted the whole room a soft white, added some art work and finally some book shelves. Our new mattress from Leesa is the jewel in the crown! 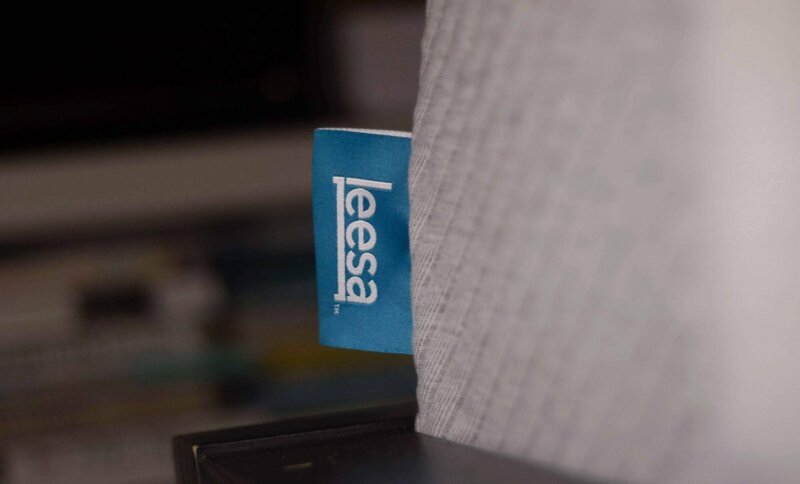 The Leesa Mattress is made entirely in the UK and is sold online exclusively. Each mattress is built to order and delivered in 5-7 business days.The mattress arrives compressed and rolled in a box, unpacking it is really simple and quite amusing to watch it ‘inflate’ as it settles into a less compressed environment. When you order from Leesa you enjoy free delivery and returns, a 10 year warranty and the opportunity to try your mattress risk free for 100 days. I think it’s really impressive that Leesa are prepared to accept returns after such a long period – when I first heard about their 100 night guarantee it stuck me they must really believe in the quality of the product. As I said we’ve been trying the mattress out for just over four weeks now and we’re very impressed. 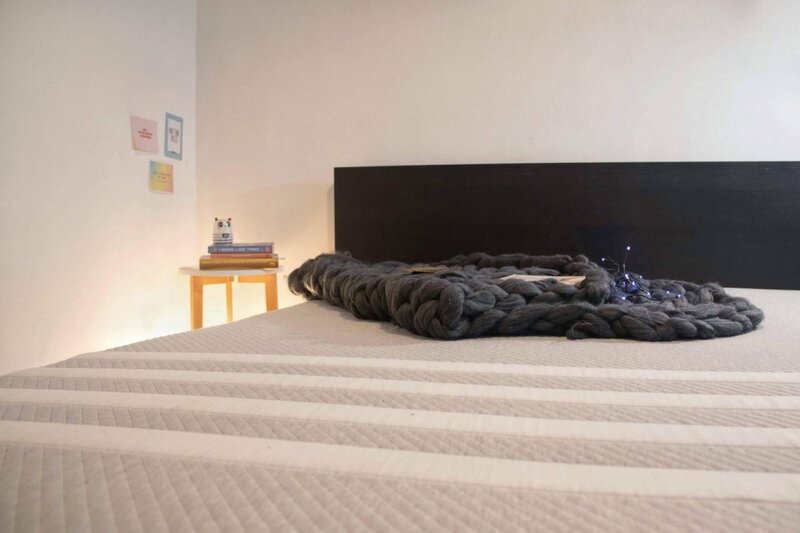 Each Leesa mattress has three foam layers which provide cooling, body contouring and pressure-relieving core support. This gives a ‘custom nights sleep’ and the effect was immediately noticeable for us. I sleep on my side but Matt prefers his back, both of us feel really well rested and supported despite putting pressure on different points. I’ve previously found that foam mattresses can be too soft, not providing enough support and beginning to sag quickly. 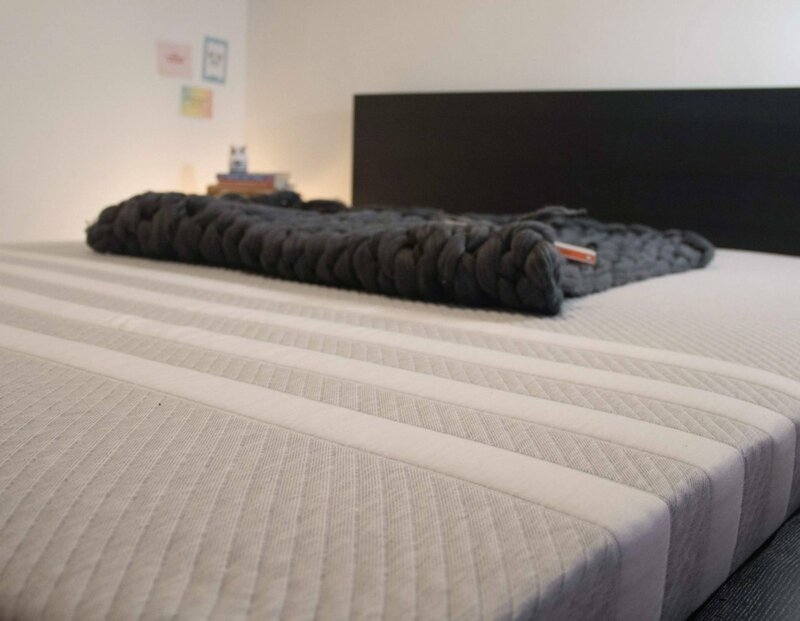 So far we haven’t had any of those issues with the Leesa mattress and I would definitely reccomend it even if you’ve previously had a bad experience with a foam mattress. 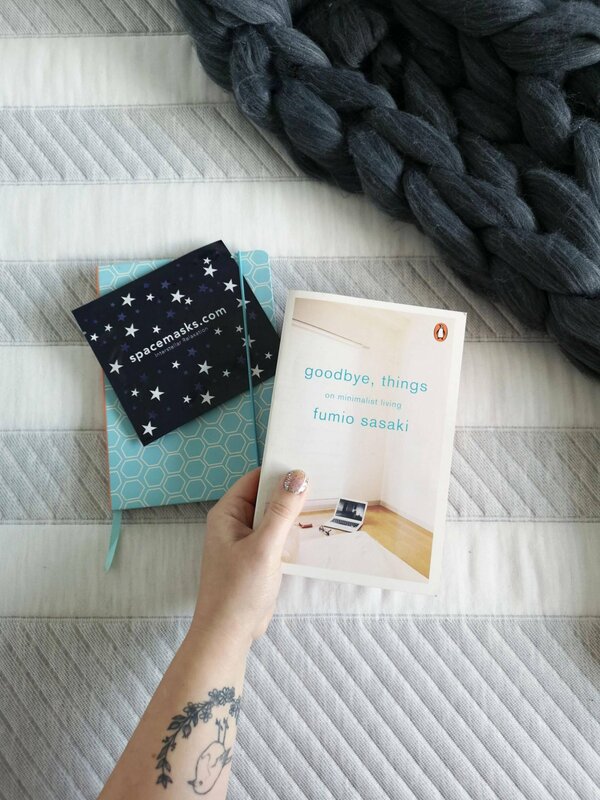 Our new, minimalist decor combined with the cooling Leesa mattress has definitely improved the quality of our sleep. I’m sure you agree as a parent that sleep deprivation and poor quality sleep impact every area of your life. Staying patient, motivated, organised and positive are virtually impossible when you’re tossing and turning on a lumpy mattress! Goodness knows our sleep is interrupted often enough by little ones so I love the fact that Leesa make sure that when you do nod off you sleep soundly. As I said previously Leesa offer a 100 night risk-free trial, if you’re not happy you can arrange to have the mattress collected. Mattresses that are returned within the 100 day period are donated to a charity near your home or recycled when one cannot be found. Leesa also run a programmer called One–Ten where they donate one mattress for every ten sold. Their other initiative is called One Earth where they plant a tree for every mattress sold to help offset the carbon footprint associated with producing and transporting the mattresses. Is the Leesa Mattress worth it? Personally I think the Leesa mattress is a really high quality product that delivers a great nights sleep. Of course a mattress isn’t something you purchase on a whim, you absolutely should do your research as it’s a pretty sizeable purchase. I’m not the only fan out there, Leesa have over 13,000 five star reviews, Which? Best Buy status, Good Housekeeping Institute approval, and are Men’s Health Lab approved. Oooh, it looks so comfortable! Love that they think about the environment too. I’ve been hearing so much about these mattresses! As someone whose child has also caused many years of sleepless nights, we definitely owe it to ourselves to upgrade our sleeping environment! I so need a new mattress for the little time I seem to spend in bed. My back is so bad and I could do with a good few hours kip before gremlin wakes me! It sounds brilliant- we desperately need a new mattress- will take a look at Leesa’s Options! A new mattress can do wonders! I must admit these ones do sound brilliant – certainly something I will look into. I’ve heard so muc about these mattresses, they sound great! My husband and I are totally different temperatures so struggle to find a balance but this sounds it would solve that for us! It’s amazing the difference a good mattress can make to your quality of sleep. I’ve always been really impressed by the 100 day guarantee – it gives such a huge vote of confidence to their product. Oh gosh I WANT ONE it sounds as though it’s so comfy, My main thing is being able to move around without my husband feeling it and then nudging me with his elbow! He sleeps like the dead – me on the other hand I’m such a fidget! This mattress sounds so lovely. We are considering a new one as although I am in my 40s I am sure it is not normal to wake up aching each day!! We are actually thinking about getting a new mattress next year. I love the idea of being able to try it for 100 nights. I don’t think sitting on one in a shop is enough to know if it is comfy at night so this is brilliant. And I always opt for companies who are conscious of their carbon footprint and attempt to do something to neutralise it. Getting a new mattress was one of the best “big” expenses I made. I’ve read nothing but glowing reviews of Leesa and I’m glad you guys are finally getting a good nights sleep. Also, the sustainability patrt is great – we need to see more brands doing this! You are so right and this is why I need to splash out on a new mattress! I have insomnia so am eternally tired, I need to get a good nights sleep! We desperately need a new mattress but I am so indecisive! I think I need one of these 100 day trials so I can take the pressure off the decision making process!